John grew up on the family cane farm at Smithfield near Cairns and has been involved with Rural Fires for over 50 years (excluding 1983-84). First Officer of Thomatis Creek Primary Producer Brigade for 9 years then sold the farm in 1982 and moved to Speewah near Kuranda. 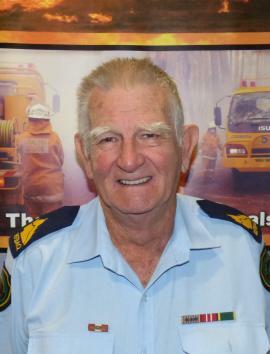 In 1984 he called a community meeting and reformed the Grove Creek Bush Fire Brigade, later to become Speewah Rural Fire Brigade. After serving as 1st Officer for 12 years he became Warden and still holds that position after 22 years. As Group Officer of Clohesy Rural Fire Group from 2003-2012 John’s job was to liaise with various infrastructure Departments in Mareeba Fire Management to achieve a better working relationship with Rural Brigades. John was elected RFBAQ Cairns Peninsula Rep in 2008 and after standing down in May 2017, he was re-elected in September 2018.